PacTrans constituent WSU’s Palouse RoboSub Club travelled to San Diego, CA to compete in the 21stAnnual International RoboSub Competitionthis past summer. The RoboNation competition, held this year from July 30-Aug. 5, aims to boost the research and development of autonomous underwater vehicles (AUV), which are designed to autonomously navigate through various tasks that reflect current and ongoing research in Autonomous Underwater Systems. RoboNation invites students to participate in this exciting underwater robotics program every year. 47 teams from around the world participated in this year’s competition, including Gonzaga University’s very own RoboSub team. This year’s theme was inspired by games of chance found in a casino, requiring the submarines to perform tasks in an underwater casino, complete with roulette tables and slot machines. 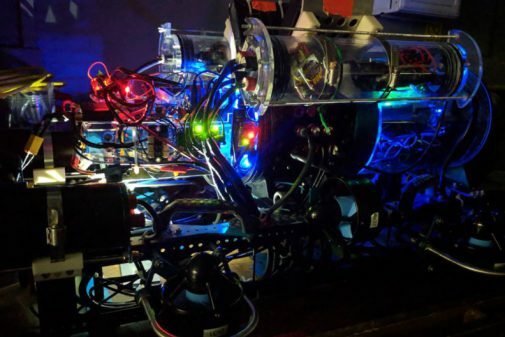 Since last year, the WSU teamhas redesigned the stability of their submarine, who they’ve named Cobalt, as well as revamped its artificial intelligence and improved its artificial vision system allowing it to see better underwater. In addition, the team also decided to install hydrophones in order to better orient Cobalt underwater. Running with the theme, the WSU team incorporated a device designed to drop balls onto a spinning roulette table located several feet underwater. The WSU competitors were successfully able to complete the pre-qualification challenge, which required them to pass through a gate, make a U-turn around a pole, located 10 meters away, and return back to the gate. Unfortunately, the WSU team did not place in finals. They did, however, earn one of the judges’ awards: resource sharing. WSU’s Palouse RoboSub Club gives motivated students the opportunity to do real-world engineering in robotics and artificial intelligence. Each year, the club builds an AUV and enters it to compete in San Diego. Cobalt was developed with the help of the Naval Sea Systems Command (NAVSEA), whose mission is to design, build, deliver, and maintain ships and systems for the U.S. Navy. Congratulations to WSU’s Palouse RoboSub Club for their great work at the competition!